Those of you who have observed these sales for the last few years, have come to expect additional presents to appear on your FTDNA page each Monday during the sale which is expected to run through December. When you click on the "Holiday Reward" icon, a discount code is revealed which is good through the following Sunday night Houston time. For example this week my coupon is good for an additional $20 off the sale price of a y67 marker test. 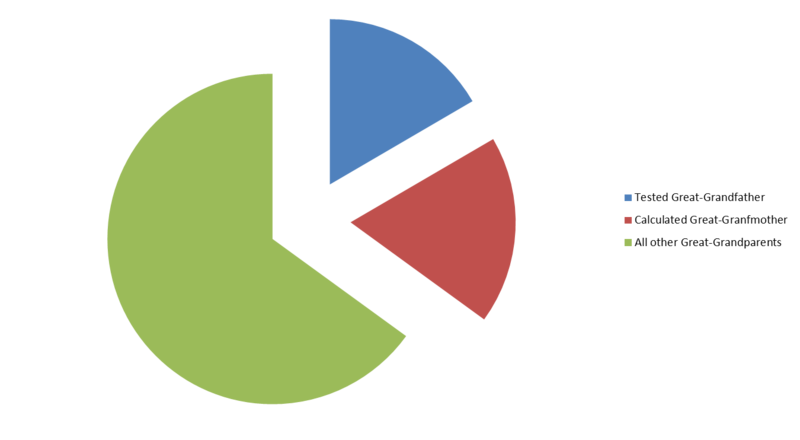 If you manage multiple accounts, be sure to check each of them each week to maximize you chances to find the best discounts. A secondary marketplace has already grown up to regift these "Reward" codes. 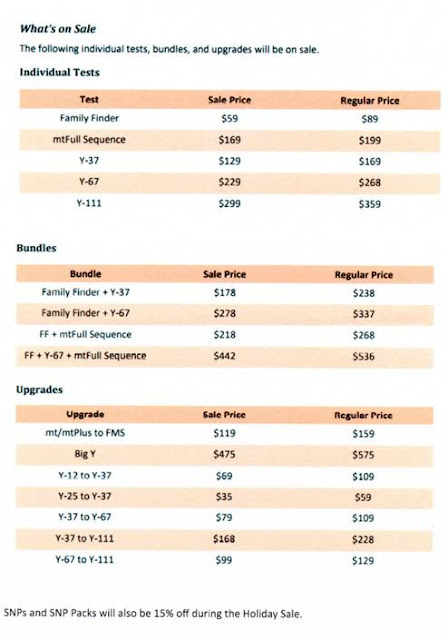 If you received a y67 discount code as I did but instead need a mtDNA test, you can deposit your unneeded code(s) at locations like this site and "shop" for discounts on the tests you need. Check back often as the bigger discounts will be posted at any time during the week as more people log into their accounts for the first time that week or they decide they cannot use a particular test. 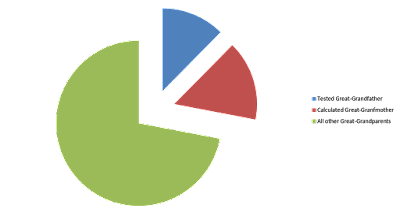 There can be some strategy involved as you decide whether to take advantage of a small discount or wait a week or so as you hope to locate a larger discount. Happy Holiday shopping to all of us as we cooperate to build our cousin matching databases to benefit us all! 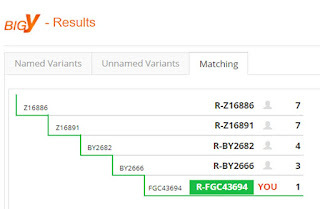 FTDNA has been "evolving" our BIG Y results for a couple of months now. As a part of that process we were regressed back to the most recent ySNP for which we had tested positive separate from BIG Y. In my case that was back a little over four thousand years ago (R-DF13). 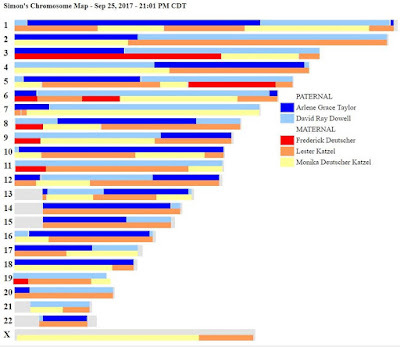 This morning the evolution of my results has progressed to the point that my trail brings me down into the genealogical era again. It is good to be back. This process is not complete. The numbers in the right column will continue to increment as the results of others are "evolved" as well. It appears that about half of the results have now completed that process. 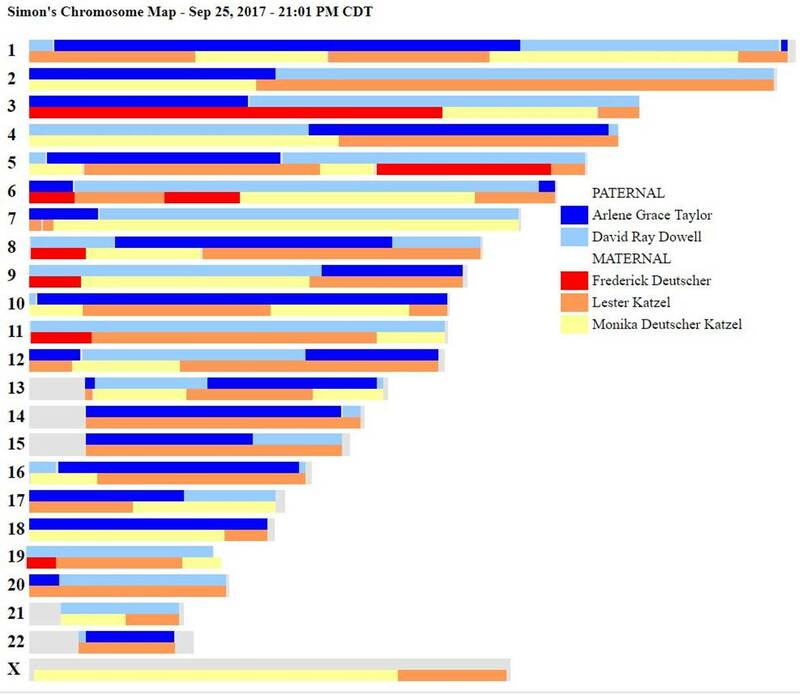 The three individuals with whom I am now showing matches on the bottom two steps share my surname and are also descendants through three different sons of my 6th great-grandfather who died in southern Maryland in 1733 -- clearly in the genealogical era. Another man who does not share my surname is expected to join the 3 matches on the second level when the processing of his results are upgraded in the near future. His family and mine were associated with each other in both Maryland and North Carolina. He was my earliest close STR match (an exact 12/12) when I first tested in 2004 and he is a 109/111 STR match today. 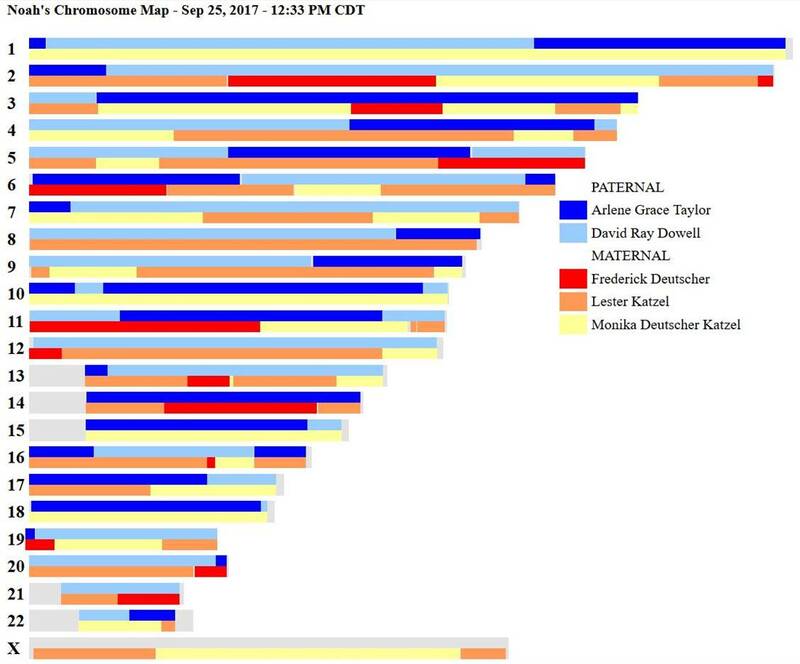 I am eager for his results to be migrated so that I can further explore which of the three sons of my 6th great-grandfather his genome seems to be most closely associated with. Prior to Big Y testing, documents seemed to indicate that he was likely to be associated with the third son -- from whom I descend. In the first round of BIG Y testing he seemed genetically to be more similar with a descendant of the second son who's line never left Maryland. If that is the case, one of our biological paternal lines may have been rerouted around 1700 or before. 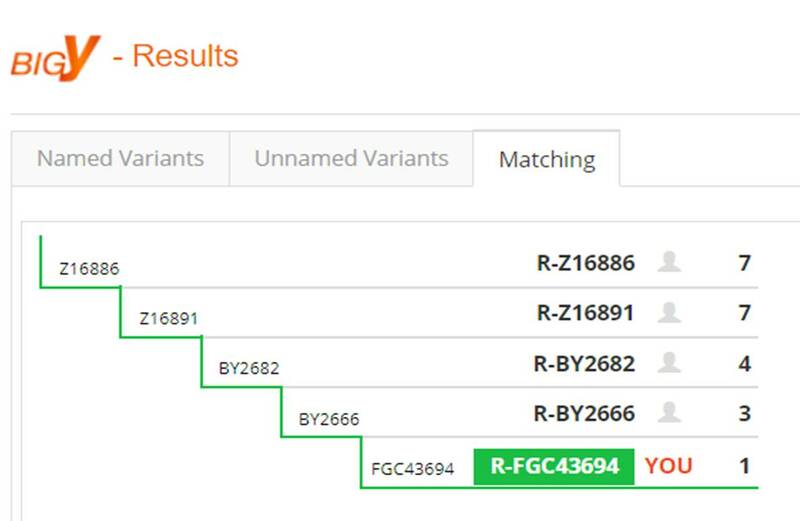 I hope the new tools we are being given by FTDNA will help me sort this out. I will be all ears and full of questions when I get to the 13th International Conference on Genetic Genealogy this weekend in Houston. When Grandson 3's Family Finder results are reported, it is expected that his matches and ethnicity predictions will vary ever further from those of his two brothers -- particularly Grandson 2. 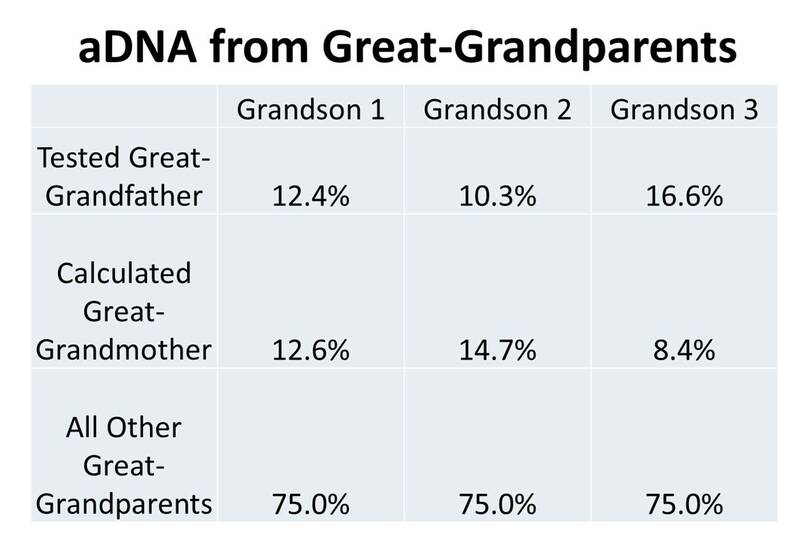 As we will see below, Grandson 3 inherited more aDNA from his great-grandfather -- the father of his maternal grandmother -- than the 15% he inherited from his Ashkenazi grandfather. This kind of calculation becomes more relevant in the current case when I took a look at contributions from great-grandparents. 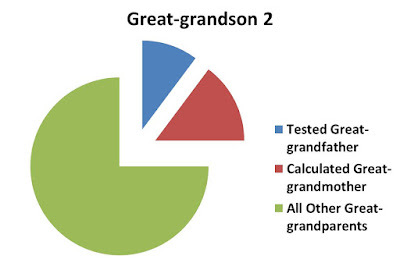 We only have actual test results from one great-grandparent who was tested a decade ago about a year before he died in his mid 90s. 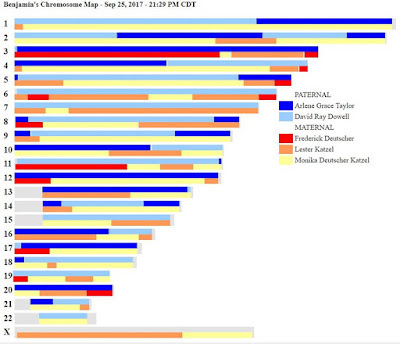 So we can use his actual test results and also use them to calculate the aDNA contribution of his wife. 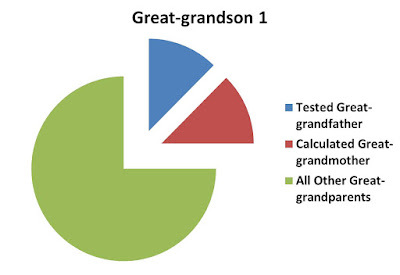 By now you probably know that the hypothesized contribution will be constructed by subtracting his tested aDNA amount from 25% -- the total contribution of each pair of biological great-grandparents. For the oldest brother it turns out that the tested great-grandfather had contributed 12.4% of his autosomal DNA. This is very close to the theoretical 12.5%. This left 12.6% for the great-grandmother to have contributed. 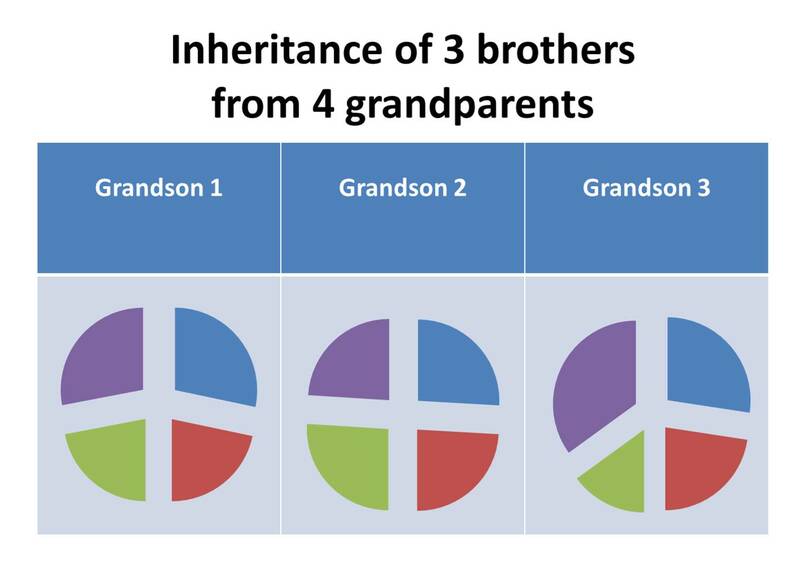 However, the second and third brothers received a more uneven contribution from this pair of great-grandparents. 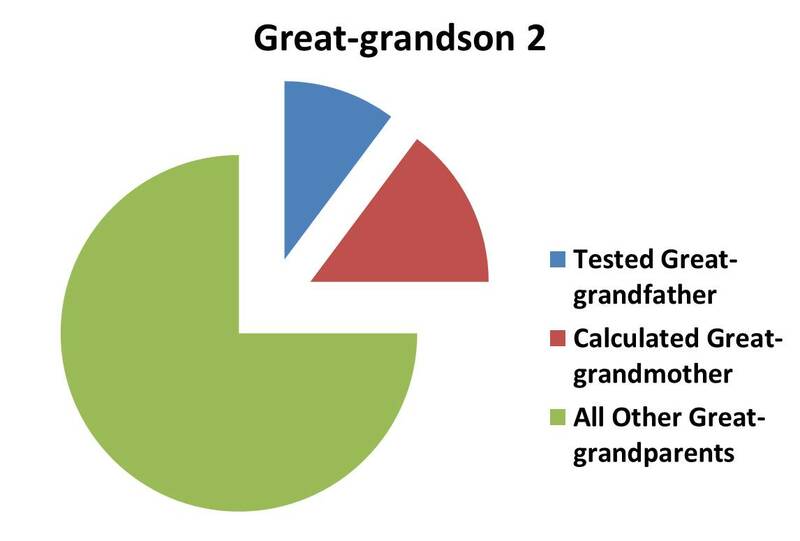 One received a greater than expected amount from the great-grandmother and the other from the great-grandfather. 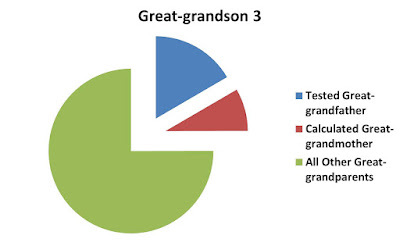 The tested great-grandfather had passed down 10.3% of the aDNA of the second brother and 16.6% of the aDNA of the third brother. 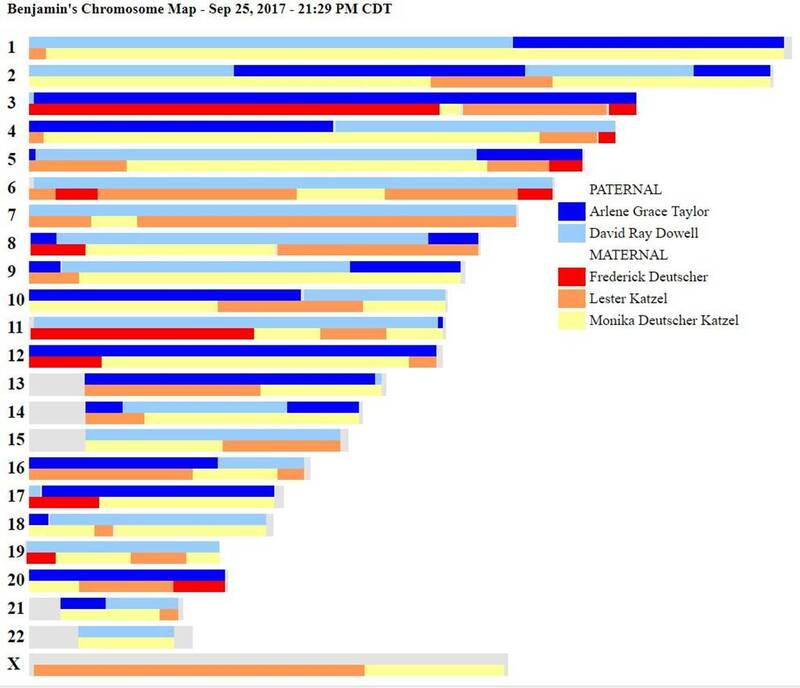 In fact the 16.6% of his overall aDNA that the third brother received through his maternal grandmother and mother was more total aDNA than this brother had inherited from his paternal grandfather (15%, see above). This result was surprising but perhaps not unusual. 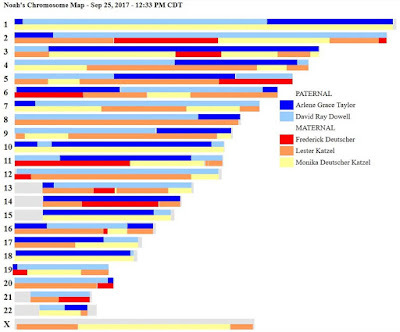 We are preconditioned to expect that we received about one half the amount of aDNA from each ancestor in each receding ancestral generation. 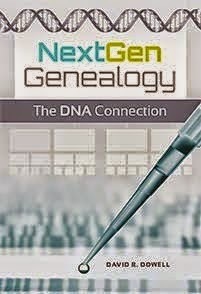 In this case that expectation was confounded because of the large amount of maternally inherited aDNA that the mother of the brothers had passed down to her third son. 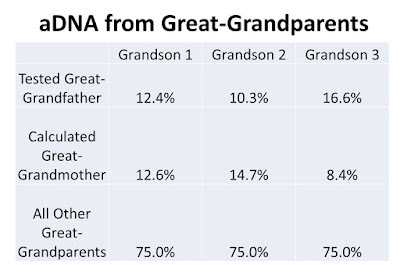 Although the mother had inherited half of her own aDNA from each of her parents, what she passed down to the third son had disproportionately represented what she had inherited from her mother by a ration of more that two to one -- 35% to 15%. 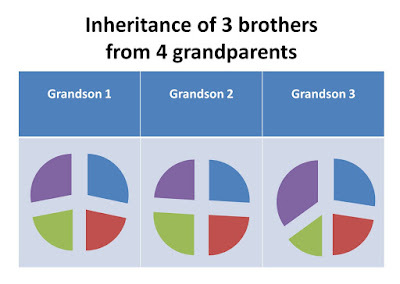 The second son inherited more of the calculated contribution from his great-grandmother than either of his brothers. 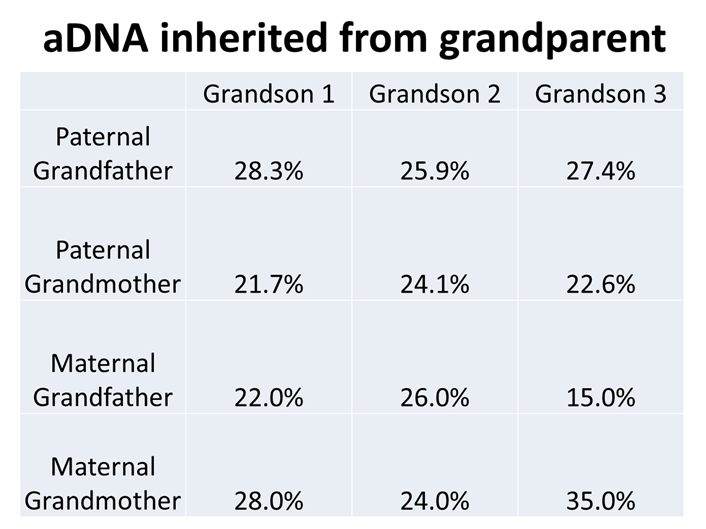 He inherited 14.7% versus their 12.6% and 8.4%. The third son inherited the most aDNA from the tested great-grandfather and did so by a considerable ratio. Although his 16.6% inheritance does not seem like a big difference from the 12.4% of one brother and the 10.3% of the other, it is about 35% more than one and 63% more than the other. 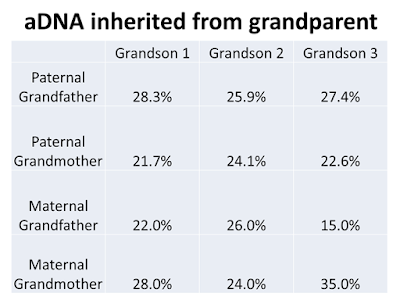 In terms of inherited ethnicity and traits, these could matter. 1. 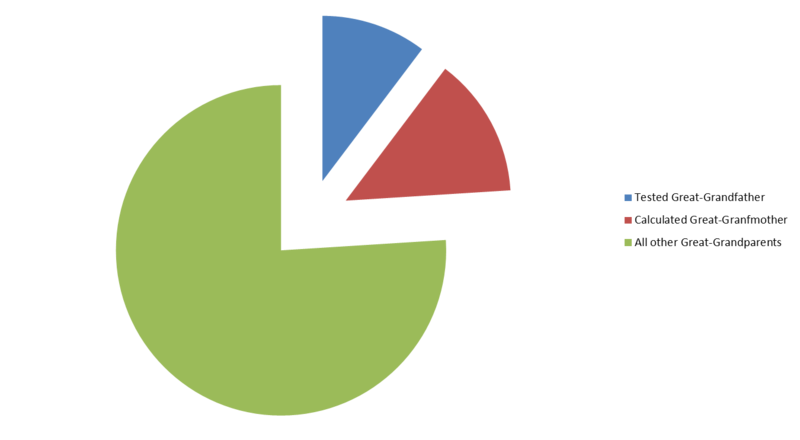 We inherit 50% of our aDNA from each parent; 50% from each set of grandparents; 25% from each set of great-grandparents, etc.